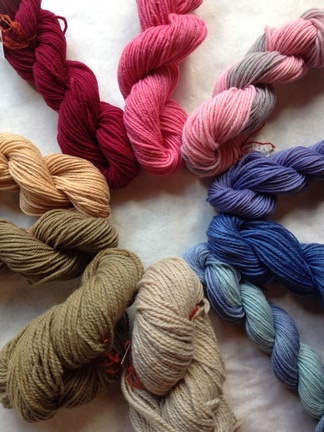 I am having so much fun experimenting with natural dyes these days. Every time I see a bright flower, or a colorful tree, I think, “Oooooh, I wonder what color dye that would make?” This weekend, I got together with Nikki of Woolen Violet, my fiber partner in crime, and we trashed the kitchen! Let me back up a sec. 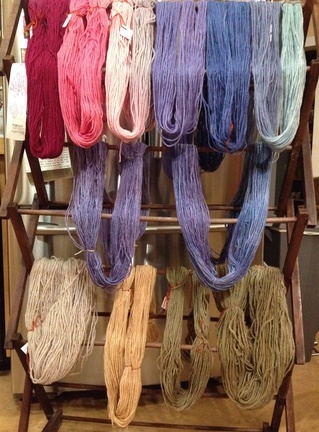 Before we could begin our dyeing, some prep needed to happen. 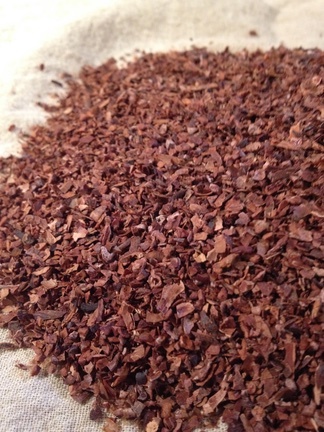 We planned to try out black beans, cocoa bean chaff, cochineal (actually a bug! ), and two woods: Indian Rosewood and Purple Heartwood. Some of these things needed time to soak, so I started the prep a few days ahead of time. On Wednesday, I chipped up the wood into small pieces. I’m very thankful for the help of my hubby as both Rosewood and Purple Heart are very hard! I put the wood into separate pots and filled them about 3/4 full with water (I used our tap water, which is well water with a pH of about 7). 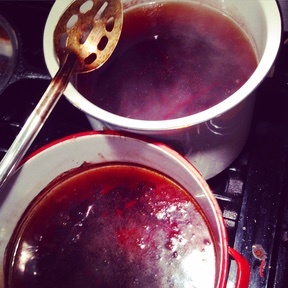 The water was simmered for 1 hour, then taken off the stove and left to sit until dye day. The top pot is the Purple Heartwood the bottom is Rosewood. Both woods put out a good bit of oil, but once the dye bath cooled down it was easily skimmed off of the top. 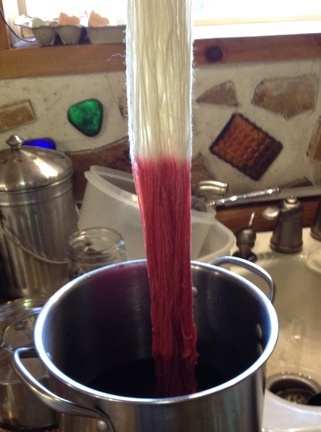 On Thursday, I began my cochineal extract. I put 1/2 oz. of cochineal in a sauce pan and covered it with 3 inches of water. I brought this to a simmer and let it bubble lightly for 30 minutes. 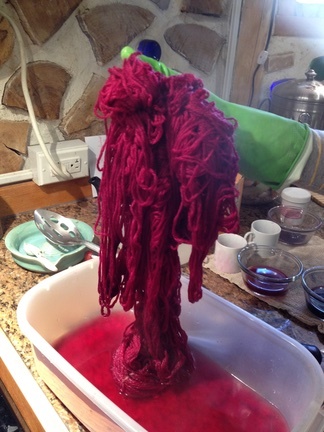 Then, I strained the cochineal through a muslin cloth and put the dye water to the side. 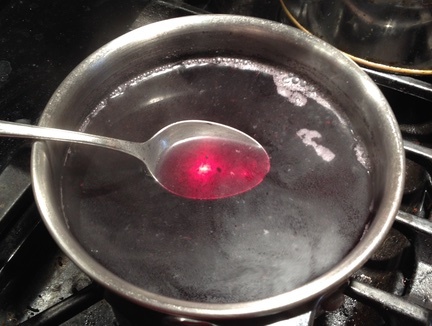 I placed the cochineal back in the sauce pot, covered it with 3 inches of water and repeated this process a total of 4 times, always reserving the dye water. This would be the dye bath. Fuchsia pink from a tiny bug! The morning before our crafty date, I put the black beans to soak in a large pot of water, stirring them often. (Cover them with lots of water, because they expand!) And I pre-mordanted my yarn. 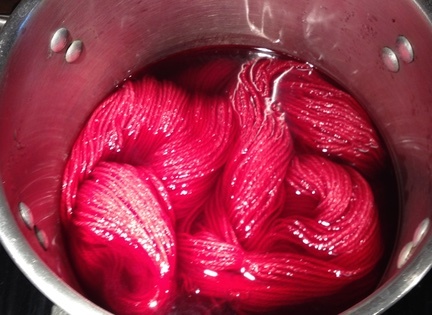 Mordants are a very important step in dyeing as they help the dye bond to your fiber. We used Alum (15% per weight of fiber) and Cream of Tartar (6% per weight of fiber). 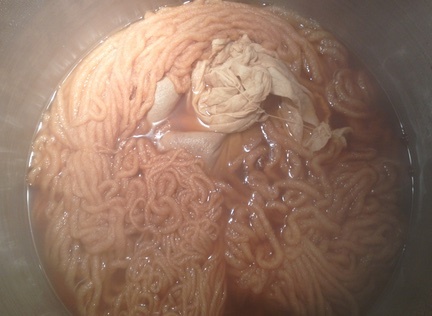 The mordants were dissolved in water and simmered, along with our fiber, for 1 hour. 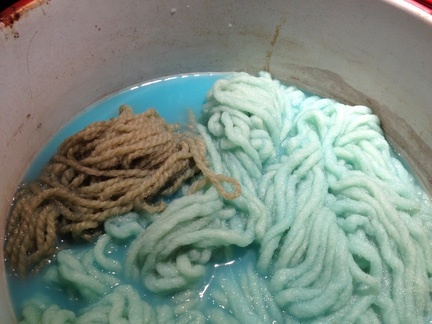 I left my yarn in the mordant bath overnight. First thing on dye party morning, I gave the beans one last stir. You want to let them sit for a few hours before you use the dye water so that all of the bean matter settles to the bottom. When Nikki and family arrived, she and I bounced around like giddy little kids in a candy shop!! There were ‘ooooooo’s and ‘aaahhhhhhh’s all day long as we watched colors change and chemical reactions happen. 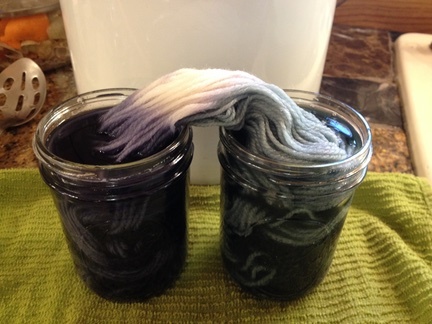 We started by scooping off some of the black bean dye and pouring it in mason jars along with our pre-mordanted yarn (Quick note: we used 100% wool for all of our dyeing). The jar on the left is straight black bean. The one on the right has a small amount of baking soda added (changing the pH). 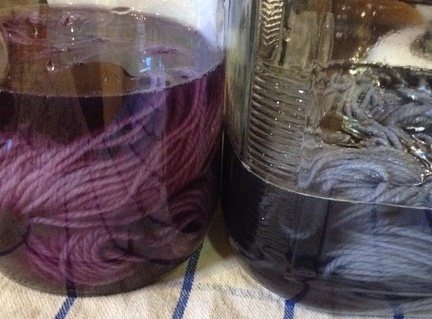 This skein has black bean, vinegar, baking soda, and copper on the left and bean, baking soda and copper on the right (I meant to put just vinegar on the left but flubbed it up). And what our sweet hubbies made for us while we were slaving away in the kitchen…. some delicious black bean soup from the beans we soaked for the dye bath.!! 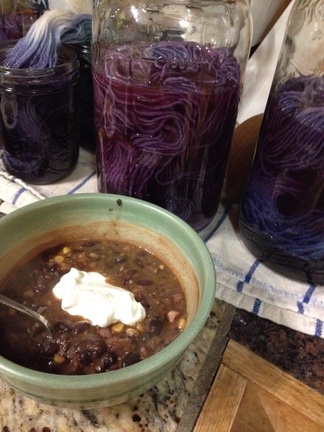 Dyeing with black beans is a cold process. Adding heat will change the color (to brown, I hear). 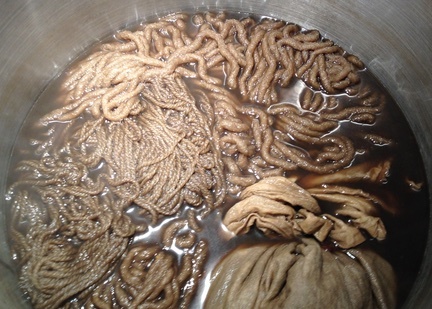 So, you put the fiber in your black bean dye and let it sit over night before rinsing and drying it. Next we moved on to our woods. 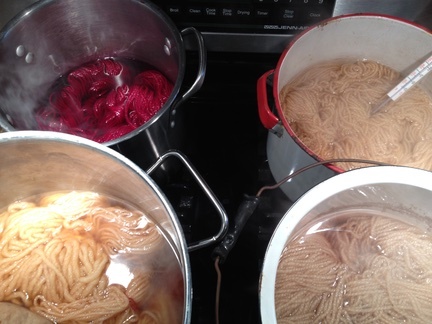 We were very surprised when we put the yarn in the pots that the vibrant colors produced pale brown yarn. Both the rosewood and the purple heartwood. So undramatic was the change that I didn’t even take a picture. We were waiting for more color to come out as it simmered (for one hour). Not much happened. 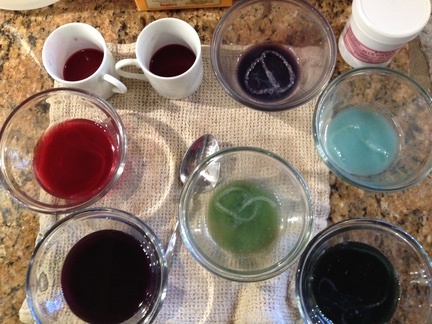 We decided to do some experimenting and pulled out some of the dye bath in small cups. We added baking soda to one, vinegar to another and baking soda and copper to a third. The Rosewood turned sky blue with baking soda and copper. Crazy Blue! 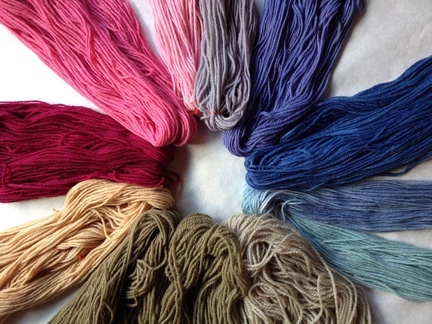 So, we tossed some of this in our main dye bath to see what we could get with our yarns. It ended up being kind of a weak coffee brown. Not a bad color, but not the blue we had hoped for. 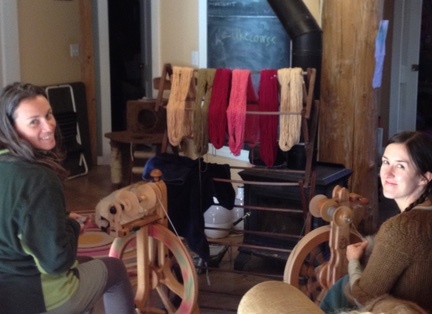 The skein on the left was the Rosewood. 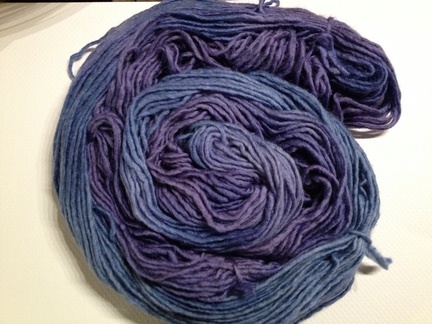 The one on the right was a white skein that was tossed in to see if it would pick up some blue. Once it was rinsed it was fairly pale in color. Here are some of our sample experiments. We’d pull dye bath out and add things to them just to see what colors we might be able to get in the main bath. I’ve read that the Purple Heartwood actually turns more purple when exposed to the sun’s UV rays. 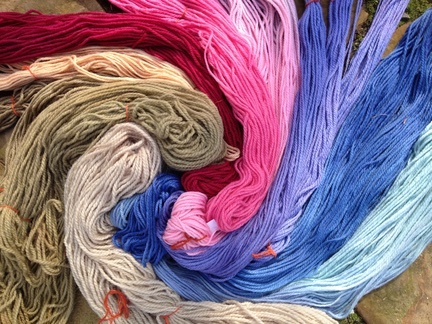 So, maybe on a hot summer day I’ll stick the yarn outside and see if there is any color change. From laying it out today in our cold winter sun, it did seem to get a bit of a purple tone to it, but definitely nothing dramatic. The “Instant Gratification Award” definitely went to the cochineal!! 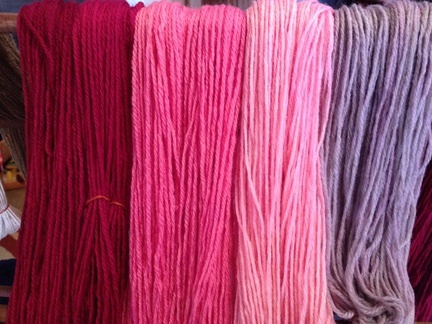 The second the yarn hit the dye bath it became a vibrant pink! 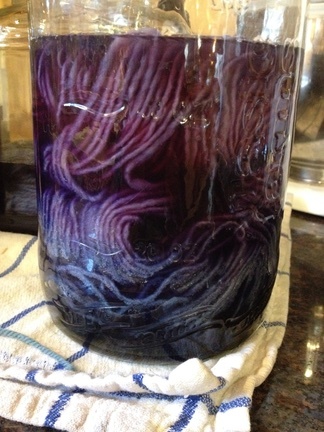 Cochineal simmered for one hour. Finally, we set up the cocoa chaff (lovingly donated by the amazing French Broad Chocolate Factory). As we poured the chaff into a muslin bag, the smell of cocoa filled the air, and once the simmering began we were all craving chocolate!! Cocoa with some baking soda and copper added. We got in a bit of spinning while things dried. I have to admit, my feet were tired by this point. We’d been standing ALL DAY watching the yarns simmer. But we soon filled our bellies with a delicious black bean soup with a pear and blueberry crisp for dessert! 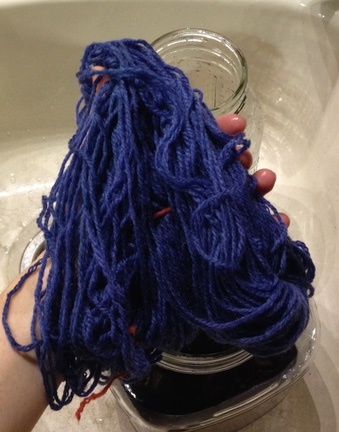 To be honest, I had a very hard time not pulling the black bean yarn out of it’s dye bath early. But, I forced myself to go to bed and woke up bright and early (thanks to one 5 year old) the next morning, ready to wash up some lovely blues! Nikki’s mix that had the baking soda on the bottom of the jar. The purple hues are black bean by itself with the blue coming out when the baking soda is added. All of our lovelies hung up to dry. I think we are really hooked now!!! Someone please send us a million white skeins to play with!! We need more! MORE!! 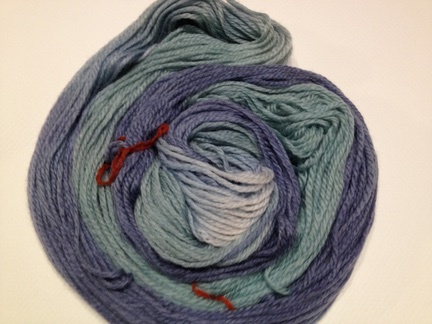 This entry was posted in Do It Yourself, Dyeing, Knitting. Wow! Your colors turned out beautifully!